After what feels like ages of anticipation, the title of Star Wars: Episode IX has been revealed as The Rise of Skywalker. Today was the first day of panels at this year’s Star Wars: Celebration and, naturally, the whole shindig kicked off with a panel for Episode IX, complete with J.J. Abrams, Kathleen Kennedy, Anthony Daniels, Billy Dee Williams, Oscar Isaac, Daisy Ridley, John Boyega, Joonas Suotamo, and Naomi Ackie, where Stephen Colbert asked the cast and crew a bunch of questions about the film that none of them could really answer. The closest thing to any real information we got is that 1) some time passes between the ending of The Last Jedi and the beginning of The Rise of Skywalker, 2) Naomi Ackie plays a character named Jannah, and 3) The whole gang would be going on an adventure together. The really good reveals didn’t come until the last few minutes of the panel when the teaser trailer was finally shown, revealing the title of the film at the end of the trailer. Solo: A Star Wars Story is not a particularly good movie. On the bright side, however, it’s not a total trainwreck either. It’s just…fine. It would be a much better movie if it didn’t have to focus on Han Solo at all. Directed by Ron Howard and written by Lawrence and Jonathan Kasdan, Solo: A Star Wars Story is the latest stand-alone anthology film in the Star Wars franchise. Starring Alden Ehrenreich as Han Solo, Solo is a prequel to the original Star Wars trilogy that reveals the backstory of Han Solo. Disney and Lucasfilm have released the first trailer for Solo: A Star Wars Story and it doesn’t look all that good. It’s kind of a mess, to be honest. Alden Ehrenreich doesn’t feel remotely like Han Solo in this trailer and it’s easily apparent why Disney reportedly had to hire an acting coach for him for this film. 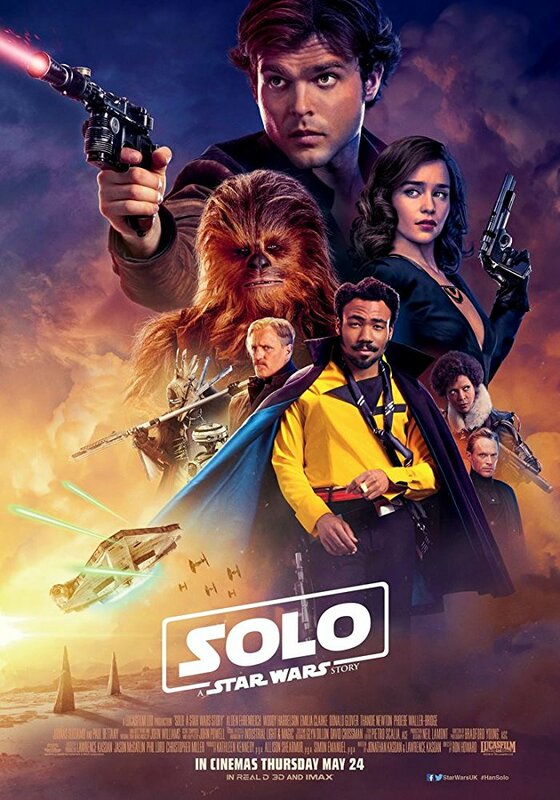 The visuals are nice, and Donald Glover as Lando looks like a lot of fun, but otherwise, it just looks kinda meh. Star Wars has gotten great at producing great trailers and mediocre movies and nothing in this trailer gives me the impression that Solo: A Star Wars Story is about to change that. I’m not sure if the film is setting out to be a comedy or an action movie (or both), but if it’s a comedy, it seems even stranger that Lucasfilm fired the original directors of the movie, Phil Lord and Christopher Miller, given their comedic background. I dunno really what to make of this trailer or the movie. The movie utterly failed at piquing my interest or making me excited for the movie. Unless the quality of future trailers increases dramatically, I won’t be seeing this film in theaters. Sigh. In case anybody really had hopes that Disney wouldn’t turn Star Wars into an oversaturated MCU-style franchise of movies and TV series, consider those hopes dashed. Today, Disney announced an all-new trilogy of Star Wars films from Rian Johnson. This new trilogy will be complete unconnected to the Skywalker Saga films (aka the main “Episodes”) and will be in addition to the seemingly endless onslaught of stand-alone Star Wars films (which really didn’t get off to a great start with the utterly mediocre Rogue One and doesn’t look to be getting any better with the utter catastrophe that was the production of Solo, what with the firing of Phil Lord and Christopher Miller as the directors of the film and the reshooting of essentially the entire movie). And, if that wasn’t enough, it was also announced that Disney would be premiering a live-action Star Wars TV series on their upcoming streaming platform (think along the lines of CBS All Access) in 2019. I mean, talk about a teaser trailer. I couldn’t be more excited for this movie right now. A+ to Disney and Lucasfilm for this trailer. It’s incredible and I can only hope that the actual movie is as good as this trailer looks. Star Wars: The Last Jedi is released in theaters on December 15, 2017.